Accounting Today names best firms to work for — and 8 are from Maryland! Accounting Today has released its list of the Best CPA Firms to Work For, and we want to congratulate the Maryland firms who made the list. This annual program is part of the Best Companies Group annual employee surveys to recognize employers (in this case, CPA firms nationally) that are considered the “best places to work.” Accounting Today will recognize these at their upcoming Growth & Profitability Summit and in a special issue in their magazine in December. 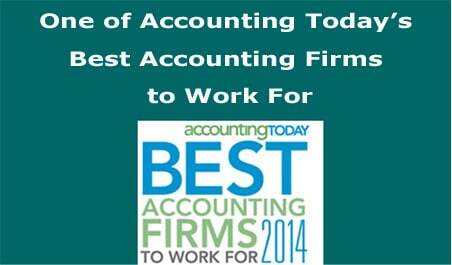 Congratulations to all of the winners and especially our Maryland CPA firms. The idea of “best places to work for” continues to gain momentum in light of the recent research around employee engagement in the workplace and how the “people policies” affect our overall organizational performance and well-being. While these surveys are not the only barometers of great places to work, they are calling attention to the need for a focus on our most valuable assets — our people. I should note that many of our larger CPA firms and many of our employers on our business, industry, government and non-profit sides of our profession are honored on different national, regional and business lists.